Grease Control | Drain King Inc. Drain King Inc. has proudly served the Minneapolis, St. Paul metro and surrounding areas drain cleaning needs for the past 25 years. 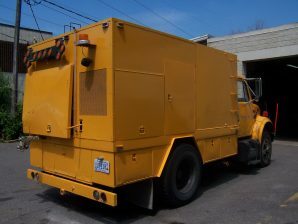 Drain King Inc. uses the most advanced technology to determine the problem and solve it quickly and cost effectively. 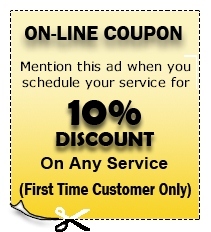 We offer both residential and commercial drain cleaning services. Our commercial drain cleaning services provide urgent, on demand service as well as scheduled maintenance programs for your properties. Don’t allow your grease traps, inflammable waste traps, floor drains or septic system shut you down. Call us today and we will sit down with you and put together a comprehensive cost effective preventative maintenance plan. Our residential drain cleaning services provide urgent, on demand service as well as scheduled preventative maintenance programs. Don’t allow you clogged toilet, clogged bathroom sink, clogged kitchen sink, clogged mainline, clogged laundry tub or clogged floor drain to flood your home today. Drain King’s phone number (763-786-3000) is answered by a real person 24 hours per day, 7 days a week, 365 days per year. Parking Ramp Floor drain Cleaning. As our society becomes increasingly aware of the consequences of our daily actions and choices, more companies are finding ways to combat problems that have been wreaking havoc on the environment. The large and ever-increasing number of people alive today is reason enough to shift our thinking into conservation mode; striving to find ways to sustain ourselves and protect the Earth at the same time. Our genius species is constantly reviving, uncovering, and discovering ways to keep our forests green, our waters flowing and clean, and our air crisp and breathable. Recycling is, without a doubt, one of the most important and revitalizing efforts any human can undertake. To reuse and recreate means less trash in landfills and less byproduct in our waters and atmosphere. This holds true even for food waste. Restaurants that recycle the fat, oil and grease (FOG) byproducts of their kitchens are taking a necessary step in keeping sewer lines, waterways, and our environment in good shape. 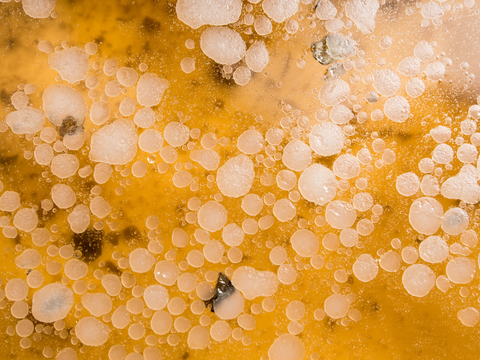 Grease accumulation in sewer lines can become a messy and costly nuisance. Using a grease trap that is serviced by professionals will save time, money, and probably a few headaches along the way. The government has started to regulate the disposal of FOG, and companies have risen to the occasion and stepped up their FOG disposal game. Business owners can rely on professionals to keep their kitchens clean, up to code, and environmentally safe. 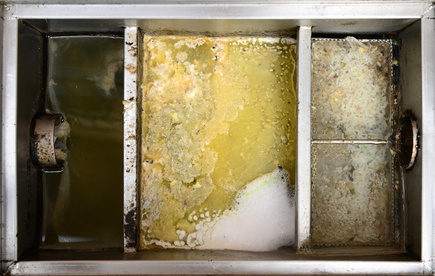 When hiring a grease trap service, be sure the fee includes removal and proper disposal of FOG, as well as a thorough cleaning of all grease traps and exterior grease tanks. Regular cleanings will increase the lifespan of equipment, decrease the frequency of clogs and spills, and eliminate the possibility of polluting waterways. Using screens in kitchen sinks, wiping up grease spills instead of spraying them into traps or drains, and adhering to the 25 percent rule for grease traps are other great ways to control FOG. Whether the goal is to save money while running a clean and efficient business or to do your part in saving the environment, keeping close tabs on fat, oil, and grease recycling and disposal is a good idea, and necessary for the well-being of your patrons and staff. Call the professionals at Drain King and allow us to keep your kitchen running smoothly. We, as residents of Earth, all have a carbon footprint. There is always a byproduct, a sweet little something left behind from everything we do. Not so sweet is the lack of knowledge available to the general public about the impact every person has on what happens to our environment, the sizable prints left by our everyday actions, and the simple ways to reduce the negative impact of those actions. According to timeforchange.org, a carbon footprint is ”the total amount of greenhouse gases produced to directly and indirectly support human activities, usually expressed in equivalent tons of carbon dioxide (CO2).” This number per person grows to be pretty substantial when counting the energy used to provide food, create comfortable living spaces, provide gas to drive a vehicle, and countless other types of energy use. Though we do indeed create a very large and mostly unsavory change to the planet and its climate, the good news is; there are many easy ways to change our daily habits that will positively impact each carbon footprint. The use of hybrid and electric cars greatly reduces carbon emissions, and it saves the user quite a bit of money on gas as well. Reducing emissions at home can be as simple as hanging clothes out to dry in the summertime and turning the thermostat down a few degrees overnight in the winter. Other ways to be mindful around the home include washing clothes in cold water as opposed to hot, replacing old and inefficient appliances with Energy Star-compliant models, and installing a programmable thermostat. Being thrifty with energy use at home is always a great idea, as it saves money and the planet simultaneously. Business owners can also play a large part in creating sustainable living practices and setting a good example in their communities. For restaurants in particular, proper handling and disposal of waste products such as fats, oils, and grease from deep fryers and sauté lines can greatly reduce pollution in sewers and local waterways. When kitchen waste is not disposed of correctly, it can clog sewer lines, which causes messy backups and damage. Installation of grease traps in commercial kitchens and arranging for regular cleaning by a professional are a great way for entrepreneurs to reduce their carbon footprints. If you are an environmentally conscious business owner, contact Drain King for information on grease trap installation and maintenance. Let’s work together to reduce the negative impact left behind by living on our planet. Commercial kitchens produce a large amount of grease and fats that need to be disposed of regularly to maintain functionality and environmental regulations. 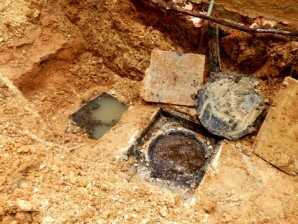 Restaurants use grease traps or inflammable waste traps to collect these FOG (fat, oil, grease) materials, which prevents them from congealing in pipes and causing the sewer system to overflow. 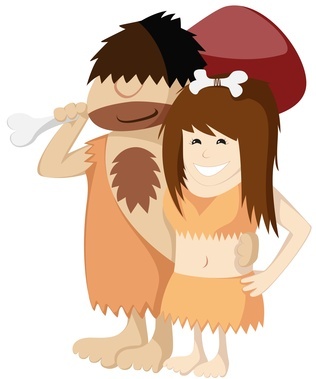 The grease collected from these kinds of kitchens can be categorized into two separate types: yellow grease and brown grease. Yellow grease is typically used cooking oil left over from deep fat fryers and industrial-sized griddles. When the fryers need to be cleaned, the used grease is emptied into metal drum containers where it cools and congeals, and can then be recycled. It is considered a “clean” type of grease because the food it comes in contact with is either fresh or frozen, so there is no chance of contamination. Recycled yellow grease is mainly used to feed livestock, but it’s also used to make soap, cosmetics, detergents, rubber, and some types of clothing. It can even be used to create biodiesel fuel! Biofuels that have been created from yellow grease burn cleaner than other types of fuel, they have a lower carbon content, and they don’t produce carbon monoxide. They can be used to generate power and heat. Brown grease is used to describe the FOG materials that are collected in grease traps or waste traps. These receptacles are designed to catch the FOGs before they can contaminate the rest of the sewer line. Some are small enough to fit under a commercial sink, while others need to be installed underground. Because the waste traps hold everything that is washed down a commercial drain, the grease mingles with rotting food and dirty water, making it unsafe and unsanitary for recycling purposes. Brown grease is usually pumped out of the waste traps and disposed of in landfills or incinerated. In the last few years, there has been some interest in creating ways to recycle brown grease. While it will never be suitable to manufacture the same types of products as its yellow counterpart, brown grease has the potential to become a viable alternative to diesel fuel and an oil substitute for heavy fuel. Developing technology may make it possible for brown grease to be processed in a manner similar to yellow grease, making it a viable source of biofuel. The most important thing to remember about grease, whether yellow or brown, is to keep it out of your drain as much as possible. If left untreated, grease buildup almost always leads to sewer overflow. Remember to collect it and throw it away instead of dumping it down your sink or toilet! The environment will thank you, and so will your wallet!